See the video at kickstarter! 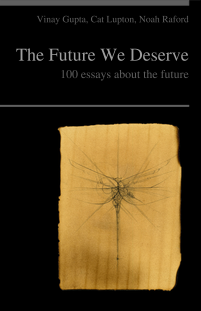 The Future We Deserve is a new book project about collaboratively creating the future we deserve. We will be working together at internet scale on internet time to brainstorm and barnstorm our way towards an image of a world we all believe in, a world of fairness, collaboration and living within a harmonious balance with nature. The book is open to all contributions — essays about technology, politics, working examples of better ways and fantastic ideas which just need to get done. The print edition will be created together, as we collaborate to select and coordinate what goes into the final book. We'll use open licenses and crowdfunding to lower the barriers to collaboration, and do our level best to make the book the start of a ongoing journey together into the future we are shaping with our lives. This is creating The Future We Deserve.